Old houses tell secrets.They tell those secrets in all kinds of ways: photographs, old records, in scratches on the wall where children told their growth spurts. Sometimes, if you are lucky, someone comes along and opens the treasure box of secrets. You get to peel away layers of stories and countless dramas played out between the walls. I got lucky, someone came along. A few months ago, a reader commented on one of my posts. Thus began a dialogue. As we chatted online we discovered that she and I had grown up ( myself, at least for part of my childhood) in the same house. She is much younger so it made even more interesting. 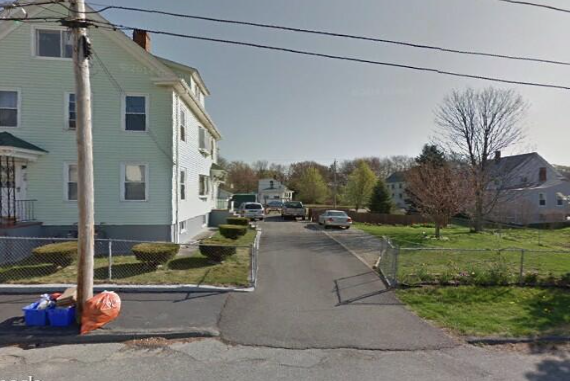 We grew up in a house on Blinns' Ct in the Village in Taunton, MA. It appears, with exceptions, that many of the houses in the Village were built in the early 1900's as was the particular house we are discussing on Blinn's Court . Our reader remembers an elderly lady of about 90 years of age, telling her (she was ten at the time) that she had been born in that house. Another link. Given time, city records would give us a whole lot more. 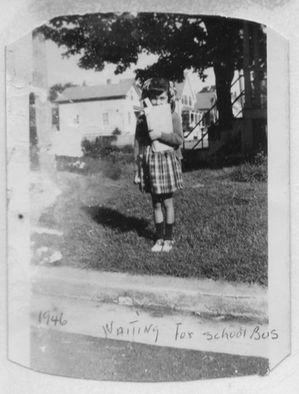 In the 1940's my parents bought the three decker, which was almost at the end of the dead -end street just off School Street. Blinn's Court and Lane's Avenue just next to it are hills awesome for sledding, especially then when there was little traffic. The two additions on the right of the house in the above photo were not there in our time and the front entrance stairs were different. They were wooden stairs and landing. When I was 7 or so I would slip through the slats and hide away from the wind. There were no big windows either. 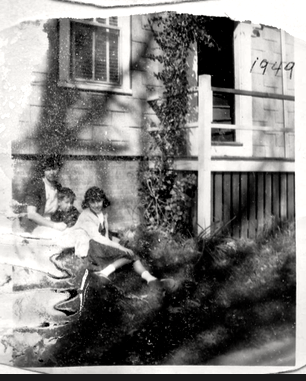 I do not have one single full photo of this house as it was in the forties and fifties. I do have quite a few of my childhood time with which to try to build a picture of it. The three decker on Blinn's Court housed three Souza families. We were on the first floor, our Aunt Eleanor and her family on the second, and our Aunt Alveda and her family were on the third. This appears below to be an earlier photo of the house and more like my memories. We did not have a fence and there was an old wooden garage where you see cars parked. On the front right grass near the street was a huge tree. It had a big filled cavity in the trunk just child-height. We would throw snowballs at it and make believe it was Stalin. Here is where the fun begins as we seek out the house history we made. Since our years there it has made a whole new batch of histories, to be sure. Looking straight back to where the cars are in the above photo, the wooden two car garage had old fashioned garage doors that you had to manually open to the sides. In the picture below you can see those doors and that they are a little askew, There was no pavement on the driveway, just packed dirt, a lot easier on little knees that tended to get skinned. 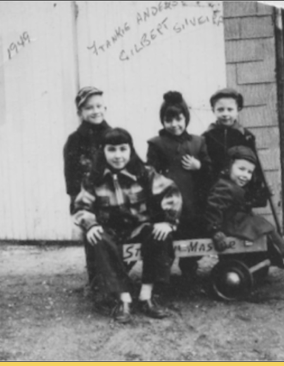 Here are a bunch of us kids just hanging out on our little red wagon. These are ancient (yet loved) photos and they get a little blurred when enlarged. Enlarging it one can see the wooden door going into the basement behind us cowkids with a little window in back of my brother. To the right are the stairs going up into the sunroom off the kitchen in the first floor apartment where we lived. The basement had a dirt floor, like many did in those days. Here is a better look of those back steps, and another of my little brother in the garb of the times. Note the ubiquitous grapevine. If you could peer around the other side of the steps you would see the old kerosene barrel sitting on its tripod. As you can see the wooden fence had seen better days. That was OK, we were all friends and real neighbors then and fences did not mean much. The house on the right is on Lane's Avenue. 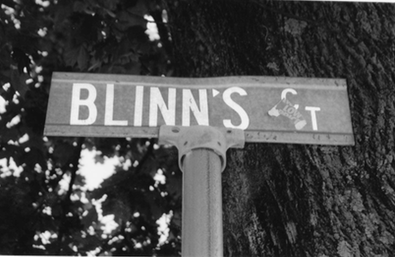 Our driveway started on Blinn's Court and opened up on Lane's Avenue, the next street over, We knew everyone on both streets, in the Village way. Now you can see the side interior and exterior steps to the second and third floors. The window is on our first floor. I love this photo. I am sitting with my brother and Mom, the rest of the photo melting from age yet still perfect for a memory. I am pretty sure that those are asbestos shingles on the house...back then, who knew? In back of little me waiting to walk up the hill to Fuller School are the front steps of the house. Pretty sure this is a joke about a school bus.... You can just make out the wooden side of the front steps with the slats where I used to hide and daydream. The front door was formal and not much used except for storing baby carriages and the like. Everyone used the back stairs for us and the side stairs for going to the 2nd and 3rd floors. You can just about see the other houses on the street. I am told that my Grandfather Souza once owned a three decker on Blinn's Ct., I do not know which one. 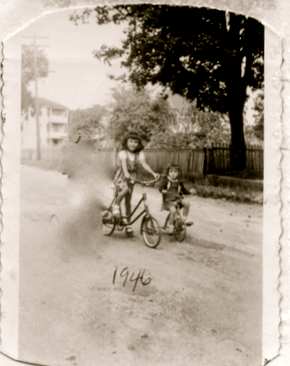 Very old photo below of my sister and I on our bikes out in front of the house on Blinn's Court. The fence behind us went around the empty lot next door to us. This street was so safe, hardly any cars went up and down that we children played with security. 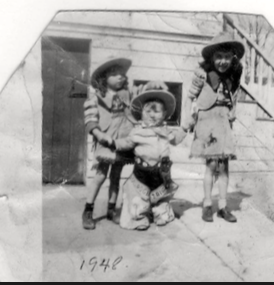 In 1949, my Mom and Aunt Eleanor hosted a Halloween Party for us "older" kids in the basement. Residing there was a big old coal furnace in the back of which I got my very first kiss. Brick walls and the musty smell of those cellars linger in my memory. Looks like all my classmates were invited and the decorations were great. I distinctly remember bobbing for apples in a big white enamel panella (as it was called in Portuguese) filled with cold water and bright red apples. 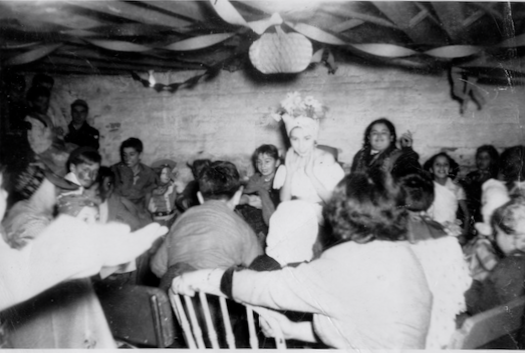 I was growing up, after all here I am dressed as Carmen Miranda, a favorite movie star of the day. The distinct advantage for an adventurous toddler like my brother (here above with our Aunt Eleanor of the Second Floor) is that he could tell his Mom he was going to see Titi (diminutive for aunt in Portuguese) on the second floor, then say he was going to see Titi on the third floor and then announce he was going home. This he did not do. Instead .with our little black cocker spaniel shadowing him. 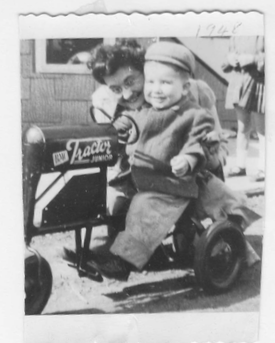 he peddled his little tractor up the hill and along School St. Someone from the Village would eventually call my Mom or just bring him home. Gives new meaning to "it takes a Village." The memories come cascading through my mind. I remember walking (shakily) in an old pair of high heels outside on the dirt driveway and the sound and feel of it as I played at being a sophisticated lady. The sense of walking up the stairs to one of the Aunt's apartments and the slight tilt of those stairs. The well-used white refrigerators and stoves that cooked up the most wonderful meals and desserts, the birthday parties with a big dose of loving. The enameled kitchen tables and chairs. A big old three decker laced with family and caring. Way back then it was not very updated but it was as comfortable as an old shoe. It saw my growing up and it seems many other growings up, too. Imagine if this house could talk. Laughter, tears, small feet running here and there. We had one of the first TV's in the neighborhood, a little round 10" screen and into the small living room crowded as many as could fit to watch Uncle Milty. The grass outside was soft and cushiony where in the summers we ran barefoot screaming with glee when a grown-up held a hose with sprinkling water to cool us off. We were always spending summer days sitting out on blankets for a nap or just lazy mind-meandering. Our grass was a thick cushion because we had a cess pool. When it rained a lot, it would bubble up and fertilize the grass. A kind of night soil. 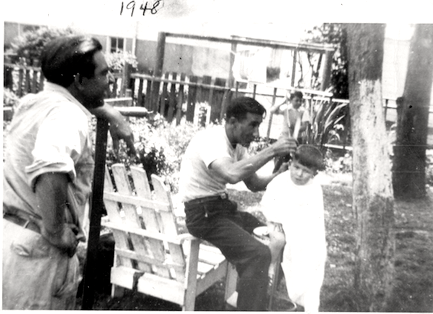 Here is my Dad cutting my brother's hair, my Uncle Bunny/John looking on. My Dad learned to be a barber when he served with the Civilian Conservation Core. My brother knew better then move around or a knock from the scissors handle would straighten him out. Again you see another rickety fence between us and the house on the other side. The same Uncle Bunny bought the house from my parents around the early 1950's when it was decided we would go to live with my Grandmother Souza up at 184 School St. That School St. house story is for another time...but what a metamorphosis it has had! The current owners of Blinn's Court graciously shared the photo of the Blinn's Court house as it is today and this excerpt from the deed as it passed from my uncle to them in 1971 when a new history page began. The stories of houses paired with photographs are fascinating. I did a little internet research on this subject finding some charming anecdotes. One home owner bought her old home along with a big empty yard. She spent most of her time working on the house, neglecting the yard. Then, the first Spring the whole yard blossomed into a rainbow garden as its legacy gift to her. Not only was it a rainbow- they were arranged by color! Sometimes houses reach out to connect you to those who loved and lived in that house before you. This was true for me when in the 80's I bought the little red house on Ashland St. built by Manny Silva (of the Top Hatters band back in the day) and his wife Kay. Manny was my Dad's partner and it felt strange to be there at first. Both of them had passed away. The color was its legacy. They loved the color red. The house was red shingles, the wall to wall carpet everywhere was deep wine red and the kitchen had a wonderful red linoleum floor I loved to polish. The house did give up a few secrets: a printing plate of the Top Hatters discovered in a little nook. Like the house above, the first Spring brought forth a legacy garden of bright red tulips! When it was time to repaint the house, I had all the shingles removed and side board put on. Everyone waited to see what color it would be...well, of course, RED ! 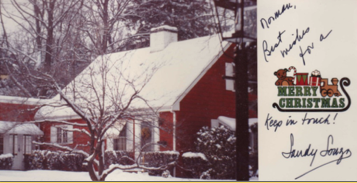 As a side note: I found this Christmas card photo of that little home on Ashland St.
in many other houses right up to where we are today. with me, and with all those who follow this blog. where those memory-keeper houses still reside always seeking the echoes of our lives. We do not see the present there, our minds and hearts are full the the past. Thank you for this blog. It brings back so many memories for me. From birth to age 12 we lived in a 3 family house on Smith St. We rented the first floor.w ,Although we were not related to the owners, we were a family! On the second floor, they were "Aunt" and "Uncle", and on the third floor was "Gramma". I remember them with love. 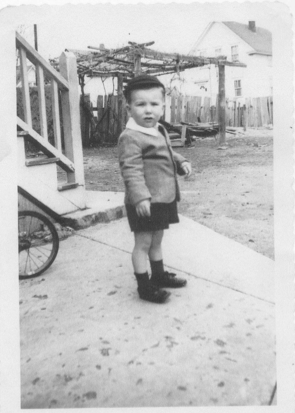 In 1959 my parents bought the house on Orchard St. thatmy grandfather had built, and we lived there with my grandmother. The second time your post brought tears to my eyes was your reference to a panela. I could instantly hear my Granny asking me to get her a panela! The history of the those times, that closeness among extended families (be they real blood relations or not) is marvelous to remember. I love that you were touched by the term Panella, it strikes a warm cord doesn't it? Thank you for sharing. Small village! My great grandmother, Maria Baptista (aka Mary Baptiste), lived at 20 Blinn's Court til her death in 1931. She moved there with her daughter Irene Coute, and Irene's husband George and their daughter Ruth. 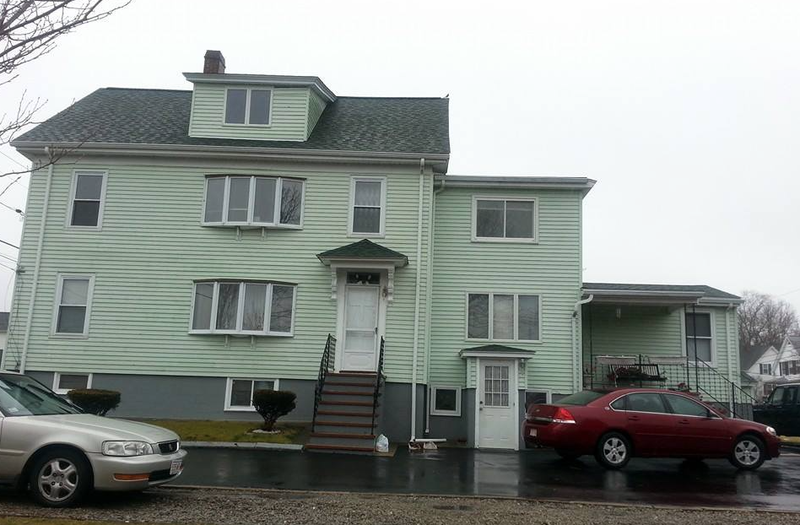 Prior to that Maria lived and raised her children at 35 Purchase St. The Village is and was a small wonderful world. It is grand that the old house is having its history built by all of us! Your shares are great! Thank you so much, Maria. Just found this site. Love it! I grew up on School St. Thanks so much! Hi What is your email address? Had trouble with the link on this site. Just love it!